For four consecutive days, my intended trip to Yoyogi Park (decided to go there after snapping photos of Ueno Park) was canceled by some unexpected event. Like stumbling into a role as an extra during a film shoot on Wednesday, and yesterday, I was suddenly issuing orders to kick start the pre-production of my new short film project. 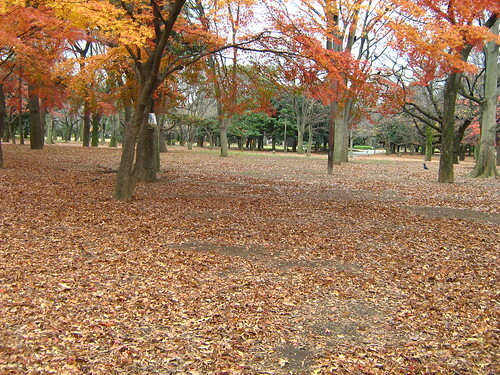 When I woke up today, I saw lots of red leaves flying past my window, and the ground outside was covered completely with leaves. 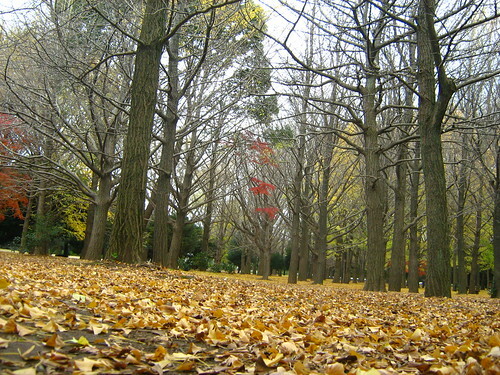 Winter had started five days ago, and I assumed that the red leaves of autumn will not last long on the trees. I was unaware of the transition until then. The sky was pale and gray, a gloominess that reflected my own melancholy. Melancholy? Or was it just the lingering effects of the flu pills I've taken? The weather forecast on my Firefox said that it would rain later in the afternoon. Circumstances were forcing me into another race against time. 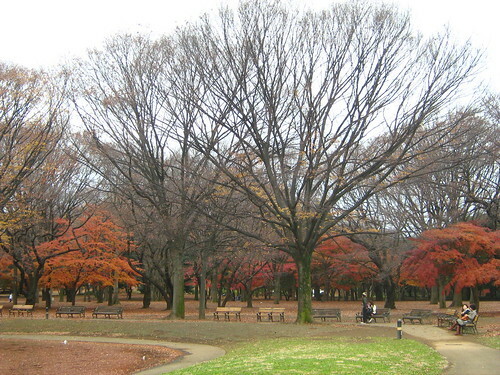 Grabbing hold of my camera and my tripod, I decided to make my way to Yoyogi Park. I've been there a few times, mostly when I was walking to the NHK station at night for the Refugee Film Festival earlier this year, and once during a Thai carnival where many food stalls and tents were erected, so I never had a good look of the park. When I entered, the park seemed bland and uninteresting. I was starting to worry that I've made my trip for no apparent reason. I half-heartedly snapped some photos of some trees, and the dead brown leaves covering the ground, a young couple balancing themselves on a wooden log, some bronze statues, a monolithic stone structure. My memory card was full, yet not a worthwhile picture in sight. 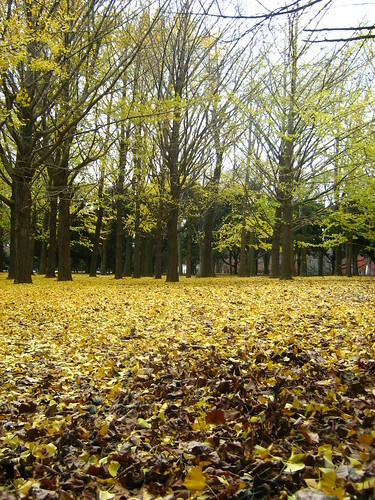 And then as I went further into the park, I was surprised by the sudden sight of golden leaves. 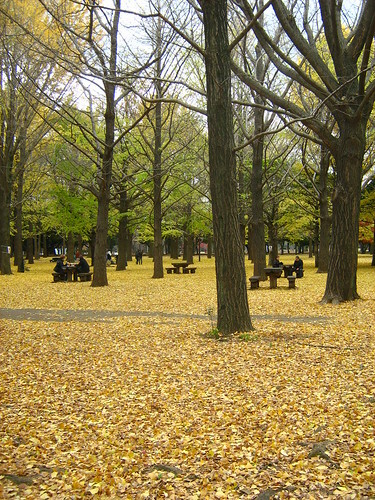 I would later understand that these were the famous ginko trees of Yoyogi Park, where the leaves turn into gold. Like Lothlórien in Lord of the Rings. Lothlórien? How much nerdier can I get? Although, to my credit, the actual name eluded me then, and my thoughts during that moment was more like "Oh, this looks like Galadriel's place in Lord of the Rings!" Still nerdy. 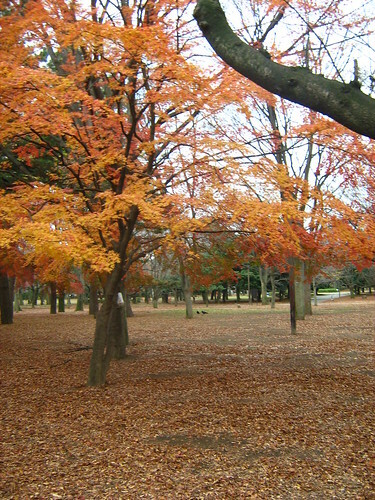 I started erasing the photos I took before I saw the ginko trees, I needed space for these photos. 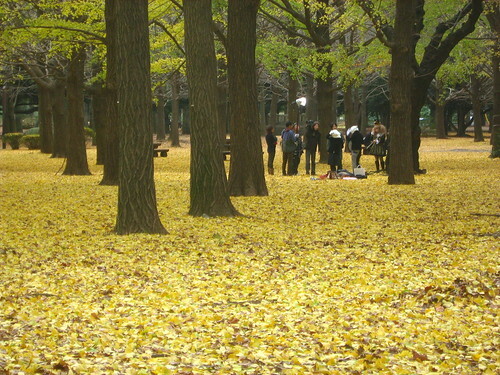 A photoshoot was occurring in the middle of the ginko trees. It was rather surreal, looking at the crew. One carried a still camera, another carried a video camera, the model was dressed up as an elf with frizzly blonde hair, holding a wooden flute, then two, a man and a woman, were wearing rabbit masks, one of them the still photographer. Are they shooting a video? Or still photos? And what's with the rabbit masks? It felt like something out of a David Lynch's movie, I thought, my mind wandering to INLAND EMPIRE. I kept a polite distance from them, and snapped a photo of the photoshoot. Not too far away from me, I saw a trio of young people, two men, one woman, doing their own photoshoot too. The man's holding a digital SLR, the woman's peering at him from behind the tree, smiling coyly. 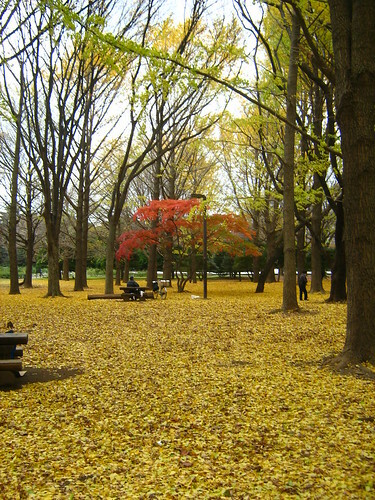 I continued my way, the golden leaves on the ground were then replaced by red leaves. 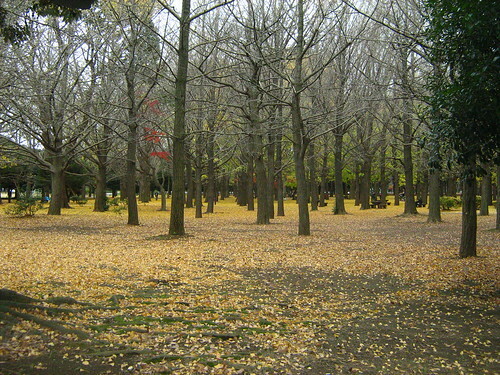 There weren't anymore ginko trees, just the normal ones by the pond. 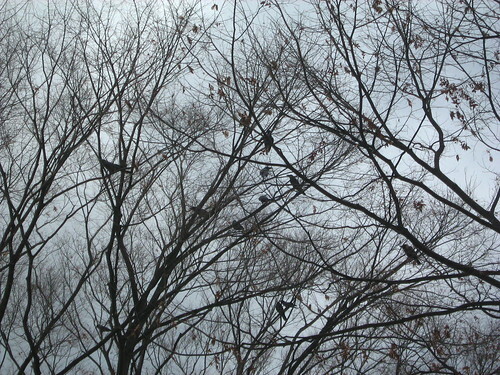 The loud cawing of crows, many of them resting upon bare tree branches. Some of them were frolicking by the pond. So this is the end of autumn. Somehow it felt much shorter than the grueling summer. I guess maybe that's because I went back to Malaysia twice during the season. 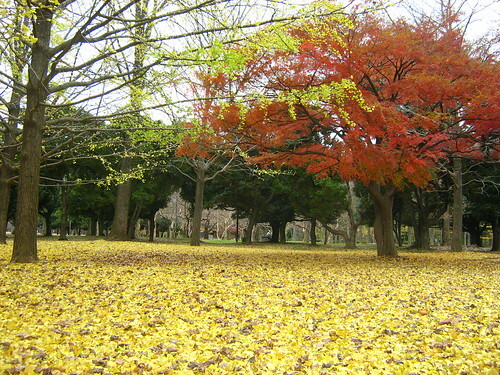 The red leaves aren't as striking as the golden leaves of the ginko trees, but still pretty nice. The wind continued to blow, and the rain came suddenly. 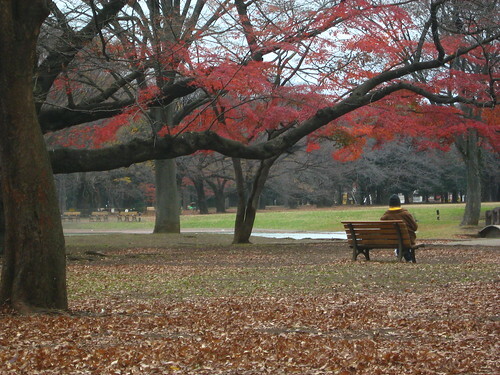 I took out my umbrella and walked hurriedly out of Yoyogi Park, as I was on my way to the exit, I saw a young woman sitting on a wooden bench, posing and smiling for the photographer whom I assumed was her boyfriend. Quite a popular place for photography. 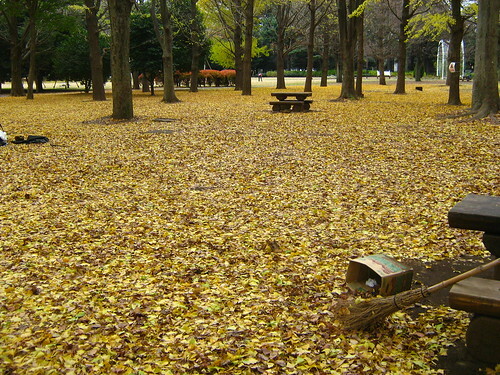 But as I walked back to Harajuku to find shelter, I wondered how many leaves would remain after the rain.